When you think of Christmas, what sorts of things come to mind? Family and friends? Church and community? Gifts large and small? Decorations and trees? Christmas music? Credit card bills? For many Canberrans, a big part of Christmas every year is the special foods we prepare and share. Food is often at the centre of our gatherings this time of year. Chocolates, puddings, trifles, custard, pavlova, gingerbread… Sweet treats from any nation may appear on our tables, often creating an almost-irresistible sugar-fest. It’s hard to resist a table laden with sugary Christmas fare. Many of us succumb to rationalisations like ‘Well, it is Christmas after all. It’s only once a year. It would be rude not to eat something when they’ve gone to so much trouble’. We know it’s not good for our waistlines. And it’s also not good for our teeth (we’ve named Sweet Treats as one of the major Dental Hazards of Christmas). Yet it seems that the most visually-appealing foods at Christmas time are also the ones laden with sugar, and the hardest ones to resist. There is a way to enjoy healthier foods at Christmas and still have them feel (and look) like a treat. We’ve sought inspiration from the internet, and have come up with some great ideas from some very clever foodies. It’s so simple! All you need are strawberries, bananas, and something to decorate them. The author uses black sesame seeds for the eyes and cream cheese to decorate Santa’s clothes. 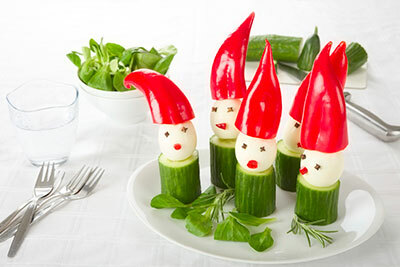 On the same page, behind the little Santa snacks, is a green Christmas tree made of broccoli florets, decorated with tiny stars made of carrots and cheese. The latter sound a bit fiddly to make unless you have tiny cookie cutters. Tiny rounds of carrots could be used to make baubles instead. These use the same idea as the ones made from strawberries and bananas. They appear to be made from cucumber, bocconcini and sweet chilli peppers. “Plant a forest of pita bread trees on your table in less than 30 minutes” is the promise of this recipe. Each tree is made from a wedge of pita bread and a pretzel stick. A mixture of guacamole, parsley and sour cream is used to colour the trees green, and red capsicum is used to decorate them. Following the tree theme (and on the same website) is a recipe for a Christmas Tree Vegetable Platter. Once again, its prime ingredient is broccoli, which is arranged in a Christmas tree shape. Baby tomatoes form the wreath, yellow capsicum slices are arranged to represent a star, pretzels are the trunk and the tree ‘sits’ on a bed of cauliflower floret snow. A creamy herb dip complete the appetiser. We think that carrot rounds could be added as baubles, or even trimmed into stars, adding another colour to the platter. The Candy Cane is simply alternating slices of strawberry and banana, arranged on a plate in the shape of a candy cane. Ode To Rudolph uses cheese wedges to represent Rudolph’s head. Mini pretzels form his ears/antlers and the final details are added using small pieces of olive and red capsicum. Their Rockin’ Wreath starts off as an inch-thick slice of cucumber. Some of the seeds are scooped out of the centre and replaced with ranch dressing. This is decorated with red and green capsicum pieces. We tried it using cream cheese, which worked a treat! This is a super-easy, fruity Christmas treat that the kids can put together themselves. The Grinch’s head is a single green grape, threaded onto the bottom of a toothpick. Add to this a thin round of banana and a then a trimmed strawberry of similar circumference (with pointy end at the top) and you’ve got a reasonable representation of The Grinch. Momables also used mini-marshmallows to trim the top of the strawberry hat, but these. of course, are optional. Super cute snowmen, each one a mini-meal. The snowmen are made of two hard-boiled eggs, secured to one another with sticks of uncooked spaghetti. Carrot makes the hat and nose, peppercorns become eyes and buttons, and sprigs of parsley become ‘the broom’. We reckon that a couple of sprigs make decent arms. Snowmen could also be fashioned out of potatoes (boiled or mashed) or bocconcini. There are a few variations on this idea that we found all over the internet. The recipe is always the same: colourful fresh fruits and berries (and sometimes vegetables) are pinned with toothpicks to a conical base, which is often itself made of fruit. The resulting Christmas Tree looks beautiful, and it makes an impressive centrepiece to the Christmas table. Watch below as the slightly dippy Kristina (from Fully Raw) shows how she makes an edible Christmas Tree. What a delicious treat for breakfast! A simple dish of porridge becomes something Christmassy and special when decorated with blueberries, mandarin and strawberry. This delightfully delicious and appealing Penguin, with or without Santa hat, might even become a regular breakfast favourite! 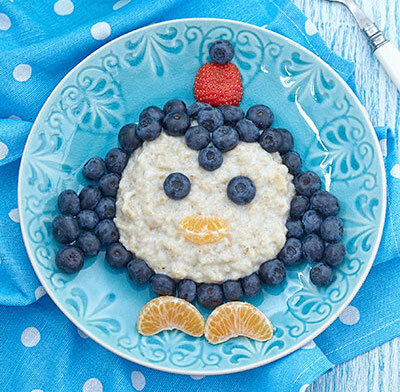 With a little imagination, all sorts of Christmassy critters could be made out of porridge and fruit. A festive variation on a cheese sandwich. 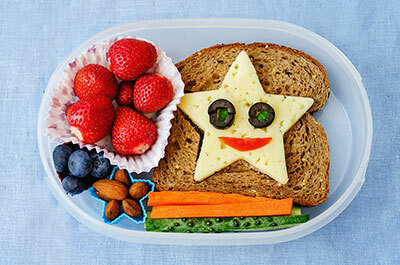 Cheese, fruits, vegetables and nuts are simply arranged around a piece of wholemeal bread to create an appealing and healthy lunch. So, what do you think? 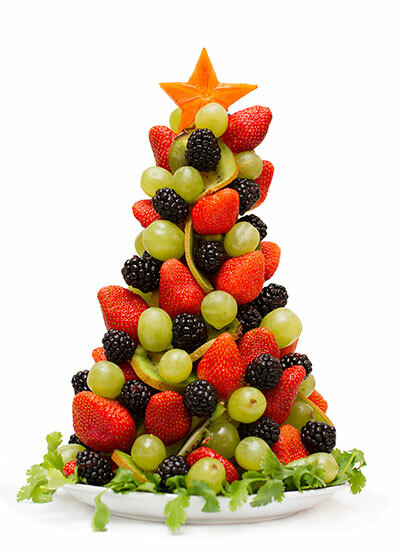 We hope you are inspired to try some healthier alternatives to sugary treats this Christmas. Perhaps you’ll create something that becomes a Christmas favourite and makes lifelong Christmas memories for your loved ones. And, their teeth will thank you!